LISBON, November 24. /TASS/. 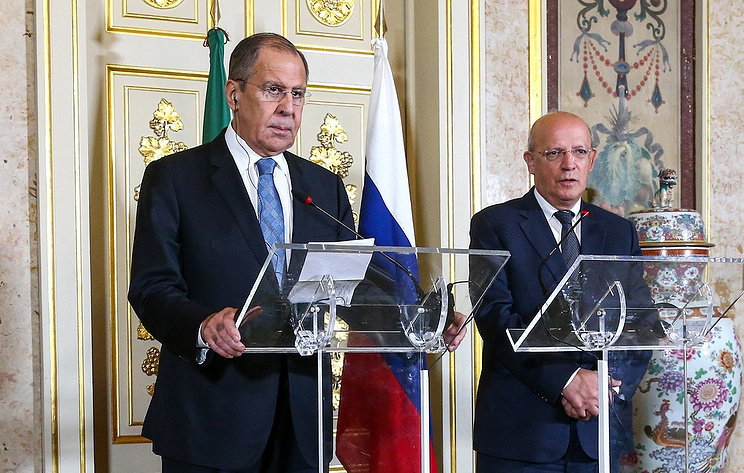 The Islamic State terrorist organization (outlawed in Russia) is allied with Washington, in carrying out the objective of regime change in Syria, Russian Foreign Minister Sergey Lavrov suggested after talks with his Portuguese counterpart Augusto Santos Silva on Saturday. "The US State Department said the other day that IS had not been beaten yet and in order to defeat IS, the main prerequisite is regime change in Syria," Russia’s top diplomat pointed out. "My guess is being confirmed that the Americans view IS as a justification for their military presence in Syria and almost as an ally in the struggle against the Syrian authorities," Lavrov said. "That is, the main objective [for Washington] now is again regime change rather than defeating IS," Russia’s top diplomat said, adding that the US apparently has "a covert agenda in Syria." The Islamic State has been routed on the territory controlled by the Syrian government but some pockets of resistance still remain, Lavrov said. "The basic IS stronghold is located on the territory controlled by the United States," Russia’s foreign minister stressed. "In the area of the township of Al-Tanf where the United States is maintaining an absolutely illegitimate presence, there has been a zone created, which they control and inside it the infamous Rukban refugee camp is located. Within this 55km zone, there are several thousand militants who are viewed by the United States for some reason as a group of persons with inviolable status, allowing the Americans to provide justification for their further presence on Syrian soil," Lavrov said.